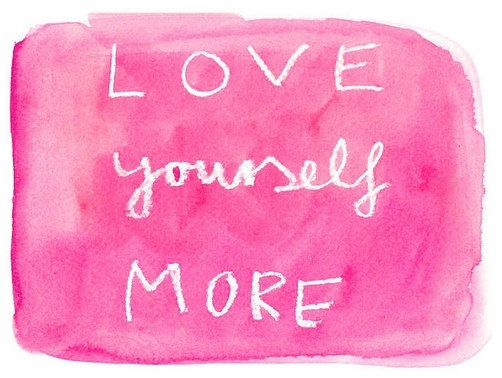 With our busy lives and schedules, sometimes we forget to indulge in a bit of "self-love." Here are 20 easy ways you can start loving yourself today. Trust me, these small steps may not seem like much, but you'll be surprised at how much a difference they can make. Find a healthy treat that satisfies you. Vanilla Greek yogurt with dark chocolate chips anyone? Take group fitness or dance classes at your campus gym. The atmosphere will not only motivate you, it will be more fun! Clean your room. A de-cluttered space will help you maintain mental clarity and feel more in control of your life. Limit your soda and coffee intake. If you are craving a soda, try some sparkling water. Same fizz and less chemicals! Take 15 minutes to yourself every single day. Take a bubble bath, meditate, read a book or whatever relaxes you. Drink more water! Dehydration almost always leads to a grumpy attitude. Connect with friends. Take time every day to either shoot off a text or call a friend. Find what you love and do more of it. Do as much of it as you can! If you love to run, sign up for a marathon and run in your free time. Read and expand your mind. Learning creates a feeling of productivity and in turn, happiness. Volunteer. This could be something as simple as holding the door for someone to visiting senior citizens at your local retirement home. Stretch. Stretching is like a treat to a tired and sore body. Reward your bod for all of its hard work with some light stretches! Spend less time comparing yourself to others. Exit the page of your friend's Facebook photo album and start creating your own memories. Listen. When you take the time to slow your pace and listen to others you will be pleasantly be surprised by the knowledge that you will attain. Light a candle. The candle flame can emit a feeling of security and serenity. enjoying delicious food. Moderation and portions are the kicker. As long as they are in check, indulgence is a perfect pleasure. List our your goals and dreams. Getting these precious thoughts down on paper helps solidify your hopes for the future. It is a visual reminder of the unlimited opportunities in the world! Get your Z's. Sleep is crucial to happiness. Without it, the body just doesn't function up to its potential. Start sleepin' and smiling will soon follow. Take a break. When the going gets tough, the smart take a break. Mental relaxation is important and allows for time to revisit goals and priorities. Pamper yourself. Paint your nails, take a bubble bath or apply a face mask. You deserve it. The reward? A refreshed and revived sense of self. Open your eyes to the world around you. Take time to appreciate your own life journey. Wow- great article with awesome tips! I definitely forget to treat myself sometimes :) Thanks for a reminder! I really love this post! Girls should read this every morning!